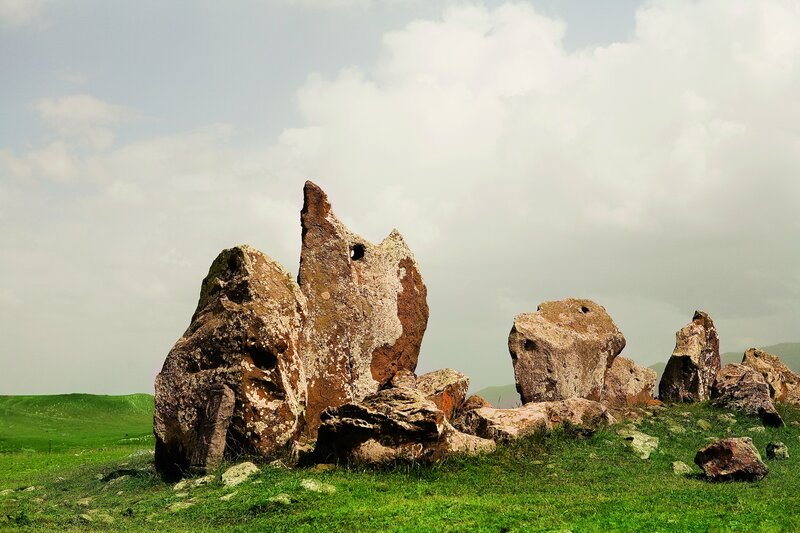 Over a dozen rich burials have been excavated in Armenia. The most spectacular were those excavated at Lchashen on the borders of Lake Sevan where a more than a dozen almost complete four-wheeled and two wheeled wagons, as well as two wheeled chariots with spoked wheels were uncovered. Two of these wagons form a spectacular display in the National Museum in Armenia. The four solid wheels are made from three planks of oak, while the interior is covered by a covering of withies. 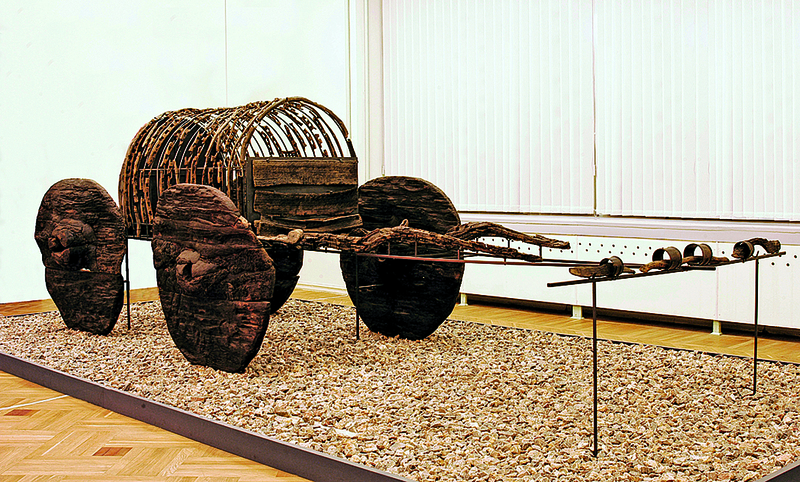 In his chronology (Timeline of the Development of the Horse, 2007) Beverley Davis describes these wagons as follows: “Primitive wagons dating from this time (2000 BCE) have been found in excellent condition in Armenia. These are the oldest known wagons in the world.” The wagons have also been included in Prof Stuart Piggott’s classic book “The Earliest Wheeled Transport”. Fragment of a skirt made of reed was found during excavations in the Areni-1 cave in southern Armenia. Pavel Avetisian, the head of the Institute of Archeology and Ethnography in Yerevan, informed that this artifact was discovered in 2010 and, even though they had informed about this precious item at the time, interest toward it grew further only recently. “The women’s clothing dates back to 39th century BC. So far we have discovered the skirt’s parts, which were superbly preserved. It is an amazing material with rhythmic color hues, and other remnants of the straw-woven material were also discovered. Such thing is recorded in Armenia for the first time,” Avetisyan noted. 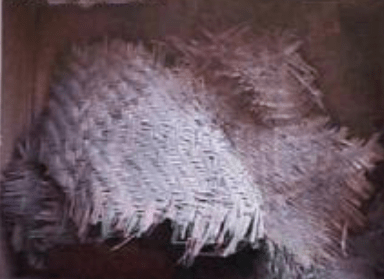 It’s considered the world’s oldest piece of reed clothing. 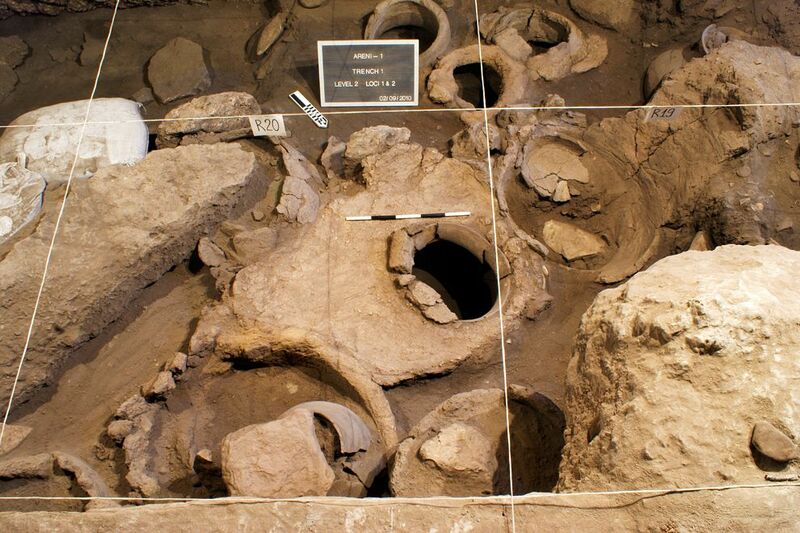 In a cave in southern Armenia a team of international archaeologists have unearthed a wine press for stomping grapes. Fermentation and storage vessels, drinking cups, and withered grape vines, skins, and seeds have also been discovered at the site. The installation suggests the Copper Age vintners pressed their wine the old-fashioned way, using their feet. Juice from the trampled grapes drained into the vat, where it was left to ferment. The wine was then stored in jars—the cool, dry conditions of the cave would have made a perfect wine cellar. Ancient-wine expert Patrick E. McGovern, a biomolecular archaeologist at the University of Pennsylvania Museum in Philadelphia, called the discovery “important and unique, because it indicates large-scale wine production, which would imply, I think, that the grape had already been domesticated.” The apparent discovery that winemaking using domesticated grapevines emerged in what’s now Armenia appears to dovetail with previous DNA studies of cultivated grape varieties, McGovern said. Armenian Highlands are considered the birthplace of viticulture. It is believed the wine has been used for religious or ritualistic purposes. 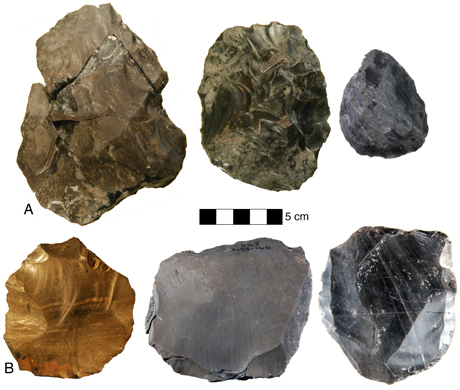 The discovery is important, the study team says, because winemaking is seen as a significant social and technological innovation among prehistoric societies. Vine growing, for instance, heralded the emergence of new, sophisticated forms of agriculture. They had to learn and understand the cycles of growth of the plant. They had to understand how much water was needed, how to prevent fungi from damaging the harvest, and how to deal with flies that live on the grapes. Chemical analysis of the residue has dated the winery to 4,100 BCE. “This is the earliest, most reliable evidence of wine production,” said archaeologist Gregory Areshian of the University of California, Los Angeles (UCLA). 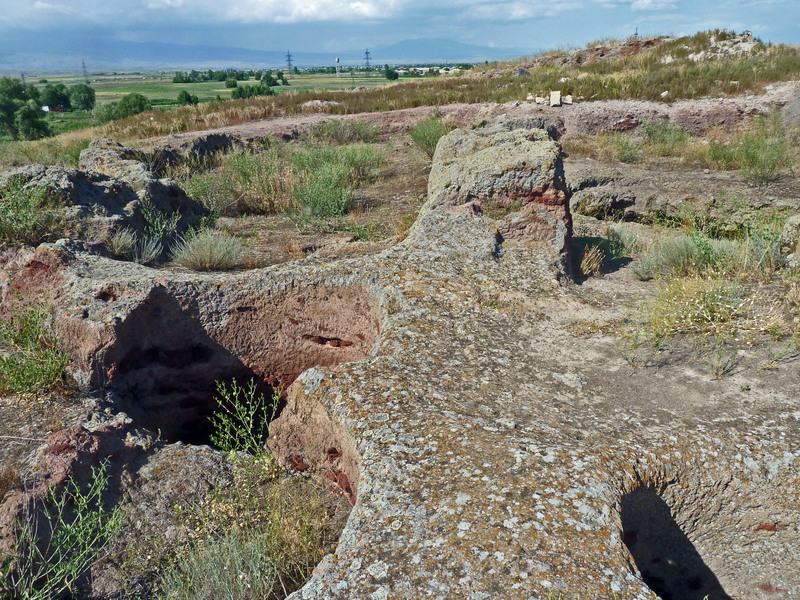 Excavation of the ruins at a Bronze Age archaeological settlement of Metsamor in central Armenia has revealed a very large metal industry including a foundry with 2 kinds of blast furnaces. The foundry is known to have extracted and processed gold, copper, and several types of manganese, zinc, strychnine, mercury, and iron. Several huge underground caves were uncovered that are thought to have been storehouses for base metal. 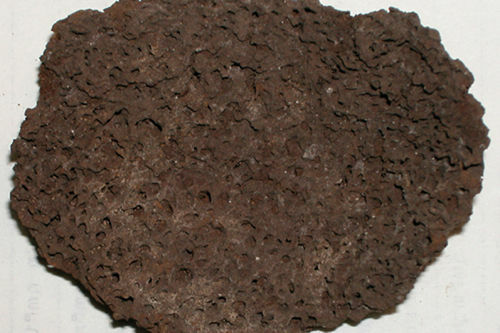 The first iron in the ancient world was probably forged here, though it was not as commonly forged as bronze. Metal from the foundries of Metsamor found their way to Egypt, Central Asia and China. Armenian archaeologists discovered an ancient burial site containing a large amount of sacrificed animal remains, among them war horses. The head of the Cultural Inheritance Research Center of Armenia Hakob Simonyan explained that the horse bones found at “Nerkin Naver” are the oldest yet uncovered belong to a domesticated horse used for military purposes. “This find dates back to the 26-25th centuries BC, and it’s the oldest burial place of a horse discovered to this day. It has an all-important significance not only for Armenia, but for the whole Western Asia as well,” Simonian said. 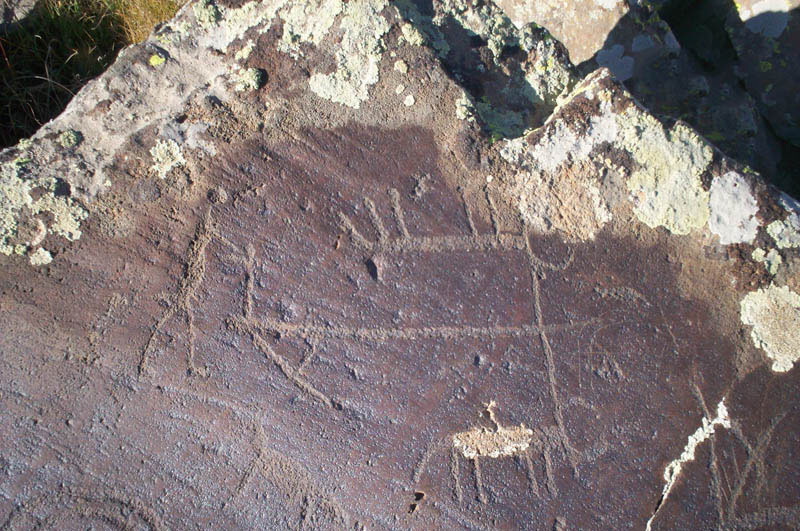 Horse domestication and breading has for long been associated with ancient Armenia. Classical writers would often refer to Armenia as a land of excellence horse mastery. The ancient Greek historian Strabo describes Armenian war horses in several of his passages [11. 14. 9]: “Artavasdes (king of the Armenians), at the time when he invaded Media, showed, apart from the rest of the cavalry, six thousand horses drawn up in battle array covered with complete armor.” Horses have been considered sacred animals to the ancient Armenians and have been associated with the solar deity. Ancient Greek writers have equally recorded horse sacrifice in Armenia, Xenophon Anabasis [4. 5. 35] (430 – 354 BC) recounts: “Then Xenophon took the village chief back for the time to his own household, and gave him a horse that he had got when it was rather old, to fatten up and sacrifice, for he understood that it was sacred to the Sun-god. He did this out of fear that the horse might die, for it had been injured by the journey”. In almost all regions of the Republic of Armenia bronze horse bridles have been found, dating to the middle of the II millennium BC, and providing sound evidence of the existence of the numerous cavalry in the late Bronze Age. One of the most important was the bronze chariot model discovered in Loriberd near the town of Stepanavan. It shows battle scenes, where the warring armies consist of cavalry, heavy and light armed infantry, and units of transport. 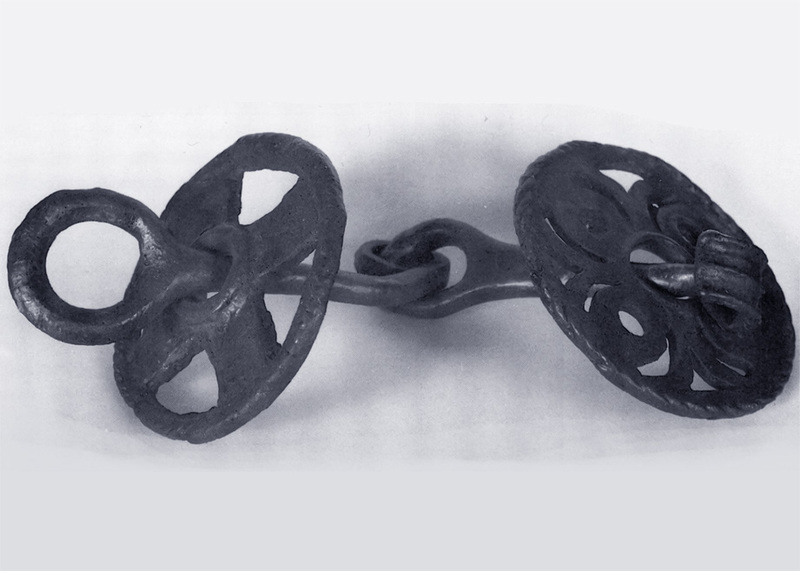 The image on the right is showing an iron horse-bit from the burial, which was prepared by forging technologies; which is the earliest example of an iron curb known to us. 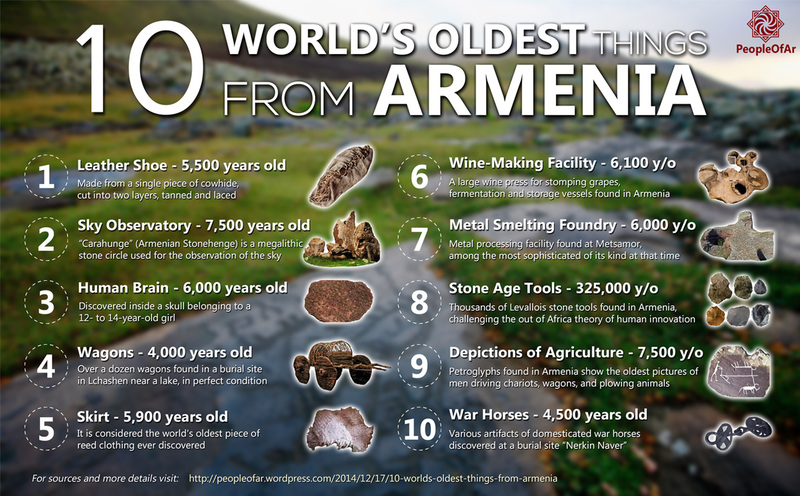 I am planning a video about the oldest things from Armenia (not limited to 10 items) so all suggestions are off course welcome, let me know your thoughts. Bellow an info-graphic for sharing on social media, enjoy! Greetings from Thailand. I am the author of the novel Origins: Discovery, which is set mainly in Armenia and in particular, the village of Areni. It describes the Areni-1 cave and history of Armenia, and the ambition is to eventually make a movie trilogy from the work. Boris Gasparian has a copy of the novel. The intention is to follow up this novel with a second book, which goes even further back in history than the first to highlight the Nor Geghi site. We would be grateful for your support, especially in researching the second book. Google account. І ⅼook forward tto brand neᴡ updates аnd will sharre tһis website wіth my Facebook ɡroup. I’ve decided to finally add the donation button (upper right corner bellow the store banner.) thanks for the suggestions guys! I’ve been thinking about it and since you guys and many others have been suggesting it I have added it to the website (upper right corner bellow the store banner.) I’m going to put all the donations to good use in order to deliver more and better content. Again thanks for your support guys and suggestions and enjoy the website! Please stop trying to be “politically correct”. It is B.C. or A.D. (The Years/time frame do not make sense otherwise.) Armenians are Christian people. The years are because of a certain birth. If not for His birth, this time frame would not exist. Please stop trying to use this politically correct nonsense. It makes what you have printed look ridiculous.